It has been a busy season so far with many Irish teams taking part in competitions at home and abroad. The inaugural Irish Mixed Doubles Championship took place at Greenacres Curling rink on Sunday 25th September. The committee was delighted to have eight teams taking part and although the format was new to some, all quickly got to grips with the new game and enjoyed the challenge of some fast moving attacking curling. The winners of the Championship were Neil Fyfe and Louise Kerr with David Smith and Yvonne Chalmers close runners up. The prize for the winners of the play downs is the opportunity to attend the 5th World Mixed Doubles Championships in Erzurum, Turkey from 23rd April 2012. In the absence of the winners David and Yvonne have accepted the invitation to represent Ireland. Good luck to the team. The domestic season got off to good start on Sunday 9th October with the Opening Bonspiel at Lanarkshire Ice Rink. Six teams took part and the overall winner was the team skipped by Marie O’Kane with Tom Roche at third, David Hume and Frances Whyte making up the front end. They beat Carolyn Hibberd’s team. Other winning teams were Tony Tierney over Fiona Turnbull and John Burns over David Whyte. The bonspiel was rounded off with an excellent tea at the rink giving everyone a chance to catch up and chat about the summer just past. The European Mixed Championship is the first International of the season and was played in Taarnby, Denmark from -30th September -8th October. This year Ireland was represented by a new team of David Smith, Skip, Claire Darragh third stones, James Russell at second and Mel Porter playing lead stones and vice –skip. This team is part of David’s development group and it gave them a marvellous opportunity to be part of the European Championship experience. Although the game scores were not always in their favour the team learned so much from their time in Denmark and will build on the experience in future years. David has worked very hard with a group of young Irish curlers to give them encouragement and the opportunity to take part in many competitions throughout the season, both at home and abroad. He must be congratulated for all his hard work, even during the summer months, when the rest of us are miles away in body and soul from any ice rink. For further details about the Development Squad please contact David Smith. He is very willing to help curlers of all ages develop their skills and, if they wish, integrate them into representative teams. Early November saw the Irish Curling Association in action again. The two teams who represented Ireland at the Senior World Championships in St Paul, Minnesota last year, along with Bill Gray’s team were invited to The European International Seniors Championship at Greenacres. All teams performed well but special congratulations go to Bill Gray and his team of David Smith, John Burns and Geoff Orr who reached the semi finals. They were beaten by a vastly experienced, in form team skipped by Per Carlsen who in turn was beaten in the final by Timo Kauste from Finland. This competition was followed a week later by the Gormac International. Two development teams as well as the usual suspects took part. Peter Wilson (Irish Peter), Tony Tierney, Carolyn Hibberd, John Furey, Alan Mitchell and David Smith all had teams involved in the competition. The games are always keenly contested and the opportunity to meet up with friends from home and abroad is so much a part of the whole weekend. At that time of the season the two European Championship teams were in the final stages of preparation for the contest which started on 2nd December. 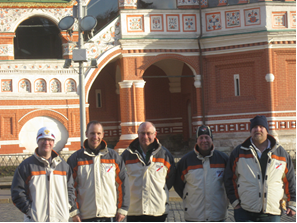 Both the Ladies and Men’s team are in division B of the European Championship and hoped to do well while in Russia. There were a few problems getting the teams to Moscow. Visas were required and these took time. Information from both the ECF and the Moscow Committee was slow in coming forward but things eventually were sorted out (even in Madrid) and it was all systems go. The men (Robin Gray, Johnjo Kenny, Bill Gray, Neil Fyfe and John Furey played in the National Province Championships, losing to a young junior team in the Quarter final. Both teams (women; Carolyn Hibberd, Louise Kerr, Gillian Drury, Hazel G-L and Jane Paterson) then set off on their Russian adventure and there is a blog to read on the ICA website. The Men’s team played brilliantly coming out on top of their group losing only one round robin game giving them a 1v2 game against Hungary to get to the B league final.. The boys were 1 down with the hammer in the 10th end but due to a time clock error by the umpires they had to hurry their last stone-a tap back for a two to win-and jammed the Hungarian counter to lose a 1 by at most 3cm.After their close miss last year in Champery, this was almost too much to bear. 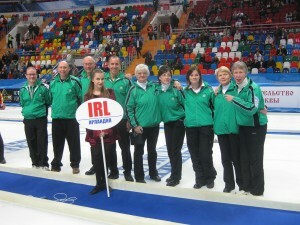 Both teams and their wee (Russian) Irish Dancer at the closing ceremony in Moscow. Well almost; JJ had done a runner at this point to join an anti-Putin protest in Red Square!! There will be a report from the women’s team to follow in the next newsletter which we will try to get out soon. The New year Bonspiel on Wednesday 28th December at Lanarkshire Ice rink and The Four Nations Competition at Greenacres on the weekend of 21st /22ndJanuary will also feature in the next epistle along with info on the upcoming mixed team playdowns, news of a Dublin Ice Rink; Seniors teams etc.